Are you doing some last minute Christmas shopping for any one with two-wheeled inclinations? If so, here’s some cool cycling stuff for the festive season. Stay visible during the dark winter months. Check out the funky Blaze Laser Lights or battery-free Reelight bike lamps and Salzmann Reflector Clips or RevoLights to illuminate your wheels. One thing that doesn’t have to be visible now is your helmet: the Hövding airbag collar marks a paradigm shift in head protection. Lots more nice gadgets are reviewed here and here (German). You help raise awareness of local air quality by investing in the Air Quality Egg project, a network of sensors monitoring levels of carbon monoxide and nitrogen dioxide. If you are interested contact Stuart at msst500@gmail.com by 10 January, and don’t forget to mention EUCG. 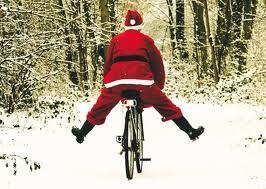 The EUCG wishes all cyclists and potential cyclists, their loved ones, their friends and neighbours, a peaceful and enjoyable Christmas and a healthy, safe and unpolluted 2014. Next Taxe kilométrique pour les voitures? Oui, oui, mais, enfin… non. I really like this post and can highly recommend David Byrne’s book.